Check out the top five plays from this Monday's Round 1 action. •Selected by Golden State in the second round (35th overall) of the 2012 NBA Draft..
•Signed a contract extension with Golden State on July 9, 2015. •Two-time NBA champion with Golden State (2015 & 2017). •Named the NBA Defensive Player of the Year in 2016-17, the first player in franchise history to earn the honor. •Two-time All-Star (2016 & 2017). •Named to the All-Defensive First Team in three-straight seasons (2014-15, 2015-16 and 2016-17), becoming the first player in franchise history to earn All-Defensive First Team honors in three-straight campaigns. •Named to the All-NBA Team twice, earning All-NBA Second Team honors in 2015-16 and All-NBA Third Team accolades in 2016-17. •Has recorded 19 career regular-season triple-doubles, which ranks second all-time in Warriors history behind only Tom Gola (20)... Warriors are 19-0 when he records a triple-double in the regular season. •Became the first player in NBA history to record a triple-double without scoring in double figures, tallying 11 rebounds, 10 assists and a career-high and franchise-record 10 steals on 2/10/17 at Memphis... Joined Alvin Robertson as the only players ever to have at least 10 rebounds, 10 assists and 10 steals in a game (Robertson did so in a quadruple-double on 2/18/86 vs. Phoenix) and became the first player with 10 or more steals and at least five blocked shots in a game since the NBA began tracking those categories in 1973-74... Finished with four points and five blocks in that contest. •Led the NBA in steals per game (2.03) in 2016-17. •Became the first player in Warriors history to record at least 150 steals and 100 blocks in a single season and the 13th player in NBA history to do so since the NBA began tracking blocks and steals in 1973-74 (first since Dwyane Wade in 2008-09)... Finished the 2016-17 campaign with a single-season career-best 154 steals to go with 106 blocks. •Became the first player in NBA history to record at least 1,000 points, 500 rebounds, 500 assists, 100 steals and 100 blocks in a single season in 2015-16 (since 1973-74 when steals and blocks were officially recorded). •Recorded 13 triple-doubles in 2015-16, breaking Tom Gola’s single-season franchise-record of nine triple-doubles set in 1959-60. •Won an Olympic gold medal with Team USA at the 2016 Olympic Games in Rio de Janeiro. •Named Western Conference Player of the Week once. •On the Warriors’ all-time regular-season career leaders lists, ranks ninth in threes made (361), 10th in blocks (415) and 10th in steals (540). •Appeared in 397 games (249 starts) over five seasons with Golden State, averaging 9.0 points, 6.8 rebounds, 4.1 assists, 1.36 steals and 1.05 blocks in 26.8 minutes. •Appeared in 80 postseason games (66 starts), averaging 12.7 points, 8.8 rebounds, 5.0 assists, 1.55 steals and 1.45 blocks in 33.8 minutes while shooting 43.3 percent from the field, 34.2 percent from three-point range and 73.2 percent from the free throw line. •On the Warriors’ all-time postseason career leaders lists, ranks first in blocks (116), second in steals (124), second in assists (396), second in games played (80), third in rebounds (704), third in three-pointers made (111), third in minutes played (2,707), fifth in free throws made (221), seventh in points (1,018) and seventh in field goals made (343). •Has tallied three triple-doubles in his postseason career, tied with Tom Gola (3) for most postseason career triple-doubles in franchise history. •Has tallied 30 double-doubles, including four 20/10 games and one 30/10 game, in his postseason career. •Has scored 20-plus points 11 times and 30-plus twice in his postseason career. •Became the first player in franchise history to record at least 100 steals and 100 blocks in his postseason career. •Recorded at least one steal in 20-straight playoff games (6/16/15-6/5/16), a career-best streak of playoff games with at least one steal. •Tallied 32 points and 15 rebounds, his first career 30/10 game (regular-season or playoffs), to go with nine assists in a postseason career-high 47 minutes in Game 7 of the 2016 NBA Finals on 6/19/16 vs. Cleveland... Scored 22 points in the first half, the most scored in a first half of an NBA Finals Game 7 since Walt Frazier scored 23 points in the first half on 5/8/70... Connected on six three-pointers (6-of-8 3FG), tying the record for most threes made in Game 7 of the NBA Finals set by Shane Battier in 2013... Joined James Worthy (36 points and 16 rebounds for the L.A. Lakers in 1988) as the only players to produce at least 30 points and 15 rebounds in a regulation (non-overtime) Game 7 of the NBA Finals. •Missed his first career playoff game in Game 5 of the 2016 NBA Finals on 6/13/16 vs. Cleveland due to an NBA suspension. •Blocked a career-high seven shots (regular-season or playoffs) in Game 4 of the 2016 Western Conference Semifinals on 5/9/16 at Portland, adding four steals to become the first player since Ben Wallace on 4/23/05 to block at least seven shots and swipe at least four steals in a playoff game... Tied a playoff career-high with nine free throws. •Scored a career-high 37 points (regular-season or playoffs) on career highs of 13 field goals and eight three-pointers in Game 3 of the 2016 Western Conference Semifinals on 5/7/16 at Portland. •Joined Tom Gola as the only players in franchise history to post multiple playoff triple-doubles, tallying 23 points, 13 rebounds and a playoff career-high 11 assists in Game 1 of the 2016 Western Conference Semifinals on 5/1/16 vs.
Portland... Hit a perfect 9-of-9 from the free throw line, a playoff career-high. •Recorded 12 double-doubles in the 2015 NBA Playoffs, joining Nate Thurmond and Wilt Chamberlain as the only players in franchise history to record at least 10 double-doubles in a single postseason. •Finished the 2015 NBA Playoffs with 212 rebounds, joining Wilt Chamberlain and Nate Thurmond as the only players in franchise history to grab at least 200 boards in a single postseason. •Tallied 16 points, 11 rebounds and 10 assists in Game 6 of the 2015 NBA Finals on 6/16/15 at Cleveland, the first triple-double by a Warrior in the postseason since Guy Rodgers in 1962 (first in franchise history in The Finals). •Tied a playoff career-high with five steals in Game 2 of the 2015 NBA Finals on 6/7/15 vs. Cleveland, scoring 10 points and grabbing 10 rebounds. •Posted four-straight double-doubles (every game of the 2015 First Round against New Orleans, 4/18-4/25), a career-long playoff streak, becoming the first Warrior to post four-straight point/rebound double-doubles in the postseason since Eric “Sleepy” Floyd in 1987. •Collected a postseason career-high 17 rebounds in Game 3 of the 2015 First Round on 4/23/15 at New Orleans. •Finished the 2014 NBA Playoffs by scoring in double figures in three-straight games for the first time in his career (regular-season or postseason). •Swiped a playoff career-high five steals to go with 14 points and 14 rebounds in Game 6 of the 2014 First Round on 5/1/14 vs. the L.A. Clippers, becoming the first Warrior to post a point/rebound double-double while swiping five steals in the playoffs since Clifford Ray did so on 5/12/76. •Made his first career playoff start in Game 2 of the 2013 Western Conference Semifinals on 5/8/13 at San Antonio, tallying five points, seven rebounds and five assists in 33 minutes. •Tallied 2013 postseason-highs of 16 points and 10 rebounds off the bench in Game 6 of the 2013 First Round on 5/2/13 vs. Denver, his first career double-double, becoming the first Warriors rookie to post a double-double in the playoffs since Chris Webber on 5/4/94 vs. Phoenix (16 points and 13 assists) and the first to do so off the bench since Chris Gatling on 4/30/92 at Seattle (14 points and 12 rebounds). •Made his postseason debut in Game 1 of the 2013 First Round on 4/20/13 at Denver, scoring two points and grabbing three rebounds in four minutes. •Appeared in 76 games (all starts), averaging 10.2 points, 7.9 rebounds, 7.0 assists, a career-high and NBA-leading 2.03 steals to go with 1.38 blocks in 32.5 minutes. •Named the 2016-17 NBA Defensive Player of the Year, the first player in franchise history to earn the honor. •Earned All-NBA Third Team honors in 2016-17, his second career All-NBA selection. •Became the first player in NBA history to record a triple-double without scoring in double figures, tallying 11 rebounds, 10 assists and a career-high and franchise-record 10 steals on 2/10 at Memphis... Joined Alvin Robertson as the only players ever to have at least 10 rebounds, 10 assists and 10 steals in a game (Robertson did so in a quadruple-double on 2/18/86 vs. Phoenix) and became the first player with 10 or more steals and at least five blocked shots in a game since the NBA began tracking those categories in 1973-74... Finished with four points and five blocks in that contest. •Averaged a league-leading 2.03 steals per game, joining Stephen Curry (2.14 steals per game in 2015-16), Baron Davis (2.14 in 2006-07) and Rick Barry (2.85 in 1974-75) as the only Warriors to lead the NBA in steals per game since steals were first tracked in 1973-74... Marked the first time in the NBA that two different players from the same team finished as the steals leader in back-to-back campaigns. •Became the first player in NBA history to tally averages of at least 10 points, seven rebounds, seven assists, two steals and one block over the course of a season since blocks and steals were first recorded in 1973-74. •Became the first player in Warriors history to record at least 150 steals and 100 blocks in a single season and the 13th player in NBA history to do so since the NBA began tracking blocks and steals in 1973-74 (first in the NBA since Dwyane Wade in 2008-09)... Finished the season with a single-season career-best 154 steals to go with 106 blocks. •Among league leaders, ranked second in deflections per game (3.9) and fifth in contested shots per game (13.7). •Scored in double figures in 39 games and 20-plus four times. •Tallied five triple-doubles... Warriors improved to 19-0 all-time in the regular season when he records a triple-double. •Recorded 17 double-doubles, including one 20/10 game. •Named a reserve on the 2017 Western Conference All-Star Team, earning his second career All-Star selection. •Swiped his 540th career steal on 4/10 vs. Utah, passing Phil Smith (539) for 10th on the franchise’s all-time steals list. •Recorded his fifth triple-double of the season (19th career) with 11 points, 12 rebounds and 13 assists on 4/2 vs. Washington. •Hit three three-pointers on 3/24 vs. Sacramento to pass Monta Ellis for 10th place on the franchise’s all-time three-pointers made list. •Swiped at least one steal in a career-best 28 consecutive games (1/16-3/20). •Finished with 20 points, eight rebounds, eight assists, four steals and a regular-season career-high six blocks on 3/14 vs. Philadelphia, the first player to post those numbers in a game since Hakeem Olajuwon did so against the Warriors on 3/3/90... Hit a career-high-tying 11 free throws in that contest. •Recorded a point/assist double-double in back-to-back games (2/27-2/28). •Notched his 500th career steal on 2/25 vs. Brooklyn. •Logged 10-straight games with at least one block and one steal, a career-best streak (1/23-2/13). •Recorded his third triple-double of the season (17th career) with 11 points, 13 rebounds and 11 assists in 35 minutes on 1/16 vs. Cleveland... Posted five blocks in that game, becoming the only Warrior to tally a triple-double in addition to five blocks since blocks were first recorded in the 1973-74 season, per the Elias Sports Bureau... Finished with a season-high +43 while he was on the court. •Logged his second triple-double of the season (16th career) with 15 points, 13 assists and 10 rebounds on 1/2 vs. Denver... Coupled with Kevin Durant’s triple-double on 12/30 vs. Dallas, marked the first time ever that the Warriors had a triple-double by different players in consecutive games (first occurrence of teammates recording triple-doubles in back-to-back games in the NBA since Boston’s Rajon Rondo and Paul Pierce did so from 1/25/13-1/27/13). •Made his 200th career regular-season start on 12/17 vs. Portland. •Recorded his first triple-double of the season (15th career) with 12 points, 12 rebounds and 10 assists on 12/13 at New Orleans... With the Warriors ahead by two points, helped seal the game with a steal with 2.3 seconds remaining followed by a pair of free throws with 1.4 seconds left in the contest. •Dished out seven assists in the first quarter, matching a career-high for assists in a single frame, on 12/5 vs. Indiana. •Tallied his lone 20/10 game of the season in double overtime on 12/1 vs. Houston, recording 20 points and a season-high 15 rebounds to go with nine assists in 47 minutes. •Missed three games due to rest (3/11, 4/5, 4/12)... Missed one game due to a left shoulder contusion (2/2)... Missed one game due to personal reasons (12/22)... Missed one game due to a left ankle contusion (11/26). •Appeared in 17 games (all starts), averaging 13.1 points, 9.1 rebounds, 1.65 blocks and 34.9 minutes to go with playoff career-highs of 6.5 assists and 1.82 steals while shooting 44.7 percent from the field and a playoff career-high 41.0 percent from three-point range. •Recorded five double-doubles, including one triple-double. •Scored in double figures 11 times and 20-plus points twice. •Grabbed double-digit rebounds seven times... Dished out double-digit assists twice. •Finished Game 4 of the NBA Finals on 6/9 at Cleveland with 16 points and 14 rebounds, his highest rebound total of the 2017 postseason, for his fourth double-double of the postseason... Crossed the 1,000-point mark for his postseason career, becoming the seventh player in Warriors history to score 1,000 points in the playoffs. •Tallied nine points and a team-high 11 rebounds in 36 minutes in Game 1 of the NBA Finals on 6/1 vs. Cleveland. •Scored in double figures in three-straight games (Games 2 through 4 of the Western Conference Finals). •Finished with a game-high +20 on-court differential in Game 4 of the Western Conference Finals on 5/22 at San Antonio, tallying 16 points, eight rebounds and eight assists. •Recorded his third career postseason triple-double with 17 points, a postseason career-high-tying 11 assists and 10 rebounds in Game 4 of the Western Conference Semifinals on 5/8 at Utah, tying Tom Gola (3) for most career postseason triple-doubles in franchise history... Connected on his 100th career postseason three-pointer in that contest, becoming the third player in franchise history to hit at least 100 threes in the postseason (Stephen Curry, Klay Thompson)... Warriors improved to 22-0 in the regular season and postseason when Green tallies a triple-double. •Grabbed 10 rebounds in Game 3 of the Western Conference Semifinals on 5/6 at Utah, his third double-digit rebound game of the 2017 postseason, to go with nine points and five assists. •Tallied his second 20-point game of the postseason (11th career) with a 2017 postseason-high-tying 21 points to go with seven rebounds, six assists and a 2017 postseason-high four steals in Game 2 of the Western Conference Semifinals on 5/4 vs. Utah... Tied a season-high (regular-season or postseason) with five three-pointers (all in the first half). •Tallied at least three blocks in each of the four games of the First Round, a career-best streak (regular season or playoffs). •Recorded the 10th 20-point playoff game of his career in Game 4 of the First Round on 4/24 at Portland, tallying a 2017 postseason-high 21 points on 7-of-11 (.636) from the field (5-of-8 from three-point range) to go with six rebounds, four assists and three blocks. •Blocked a 2017 postseason-high six shots in Game 3 of the First Round on 4/22 at Portland. •Posted his second consecutive double-double with 12 rebounds and 10 assists to go with six points and three blocks in Game 2 of the First Round on 4/19 vs. Portland. •Recorded 19 points, 12 rebounds and nine assists to go with five blocks and three steals in Game 1 of the First Round on 4/16 vs. Portland, becoming the first player in NBA history to post those figures in a playoff game since blocks and steals were first recorded in 1973-74. •Appeared in 81 games (all starts), averaging career-highs of 14.0 points, 9.5 rebounds, 7.4 assists and 1.40 blocks to go with 1.47 steals in 34.7 minutes, shooting a career-high 49.0 percent from the field. •Named to the All-Defensive First Team for the second-straight season, becoming the first player in franchise history to earn All-Defensive First Team honors in back-to-back campaigns and joining Nate Thurmond as the only Warriors to earn multiple First Team honors in his career. •Finished second in Defensive Player of the Year voting (44 first-place votes) behind San Antonio’s Kawhi Leonard for the second-straight year. •Among NBA leaders, ranked seventh in the league in assists per game, leading all forwards... Became the sixth forward to average at least seven assists per game in a single season (joining LeBron James, Larry Bird, Wilt Chamberlain, John Havlicek and Grant Hill). •Tallied the first 13/9/7 season since Grant Hill in 1996-97. •Became the first player in NBA history to record at least 1,000 points, 500 rebounds, 500 assists, 100 steals and 100 blocks in a single season (since 1973-74 when steals and blocks were officially recorded). •Recorded 13 triple-doubles, breaking Tom Gola’s single-season franchise-record of nine triple-doubles set in 1959-60. •Scored 20-plus points 17 times... Posted 33 double-doubles, including 11 20/10 games, which are both single-season career-highs. •Warriors tallied a 97.5 Defensive Rating with him on the court, compared to a Defensive Rating of 109.5 with him off the court. •Recorded his 13th triple-double of the season with 22 points, 10 rebounds and 10 assists on 4/3 vs. Portland. •Swiped a career-high-tying six steals on 4/1 vs. Boston. •Surpassed the 1,000 point mark for the season for the first time in his career on 3/29 vs. Washington... Tallied a double-double, which included a career-high 16 defensive rebounds, in that contest. •Recorded his 12th triple-double of the season on 3/27 vs. Philadelphia with 13 points, 11 rebounds and 11 assists. •Hit a perfect 9-of-9 from the free throw line on 3/11 vs. Portland, a season-high for free throws made and the most he has ever hit without a miss in his career. •Became the first player in NBA history to post at least 14 rebounds and at least 14 assists in a game where he did not make a field goal (0-of-8 FG) on 2/27 at Oklahoma City... Tied a career-high with six steals in that contest. •Recorded his 11th triple-double of the season with 18 points, 11 rebounds and 10 assists on 2/20 at the L.A. Clippers. •Named a reserve on the Western Conference All-Star Team, earning his first career All-Star selection... Tallied four points, five rebounds and two steals in 12 minutes... Joined Stephen Curry and Klay Thompson to give the Warriors three players in the All-Star Game for the first time since 1976, when Rick Barry, Phil Smith and Jamaal Wilkes all represented Golden State at the league’s annual showcase. •Set the single-season franchise-record with his 10th triple-double on 2/3 at Washington, breaking Tom Gola’s mark of nine triple-doubles set in 1959-60 and becoming the first player in franchise history to record a point/rebound/assist triple-double while also blocking at least five shots (since blocks were first recorded in 1973-74). •Tallied 20 points, 10 rebounds and 10 assists for his franchise-record-tying ninth triple-double of the season on 1/31 at New York, hitting a perfect 9-of-9 from the field to become the first player to go perfect from the field on at least nine attempts in a triple-double since Wilt Chamberlain in 1967... Became the first Warrior to go perfect on at least nine attempts in any game since Chris Mullin in 1990. •Dished out his 292nd assist of the season on 1/16 at Detroit, a single-season career best. •Recorded his fourth triple-double in five games (eighth of the season) on 1/8 at Portland, tallying 11 points, 13 rebounds and 10 assists. •Became the 15th player in NBA history to record three-straight triple-doubles on 1/4 vs. Charlotte (his seventh triple-double of the season), tallying 13 points, 15 rebounds and 10 assists to join Tom Gola (1959-60) as the only Warriors ever to post three-straight triple-doubles. •Earned his first career Western Conference Player of the Week honor for games played from 12/28-1/3 after posting back-to-back triple-doubles and leading the Warriors to a 3-1 week with averages of 18.8 points, 11.3 rebounds, 9.5 assists and 2.50 steals in 36.0 minutes, hitting 46.2 percent from the field and 54.5 percent from three-point range. •Tallied his second-straight triple-double (sixth of the season) on 1/2 vs. Denver with a season-high 29 points, season-high 17 rebounds and 14 assists, becoming the first Warrior ever to post consecutive triple-doubles in back-to-back games twice in the same season (first to do so in the NBA since LeBron James and Jason Kidd in 2007-08)... Became the first player since Larry Bird in April 1987 to post at least 29 points, 17 rebounds and 14 assists in the same game, joining Bird, Oscar Robertson, Elgin Baylor and Wilt Chamberlain as the only players ever to record those numbers in a game... Joined Larry Bird (1980 & 1981) and Aaron McKie (2000 & 2001) as the only players ever to finish a calendar year with a triple-double and open the following year with a triple-double. •Recorded his fifth triple-double of the season on 12/31 at Houston with 10 points, a career-high 16 assists and 11 rebounds, the most assists by a starting Warriors forward since Rick Barry dished out 19 assists on 11/30/76 at Chicago... Dished out 12 assists in the first half, a career-best for any half. •Posted his fourth triple-double of the season with 16 points, 11 rebounds and 10 assists on 12/16 vs. Phoenix. •Recorded 24 points and 11 rebounds on 12/12 at Milwaukee, tallying back-to-back 20/10 games for the first time in his career. •Tallied 24 points, 11 rebounds, eight assists, five steals and five blocks in a career-high 50 minutes on 12/11 at Boston, becoming the first player to post those numbers in a game since Hakeem Olajuwon in 1990... Per the Elias Sports Bureau, became the third player in NBA history to record at least 20 points, 10 rebounds, five assists, five steals and five blocks in the same game (since blocks were recorded in 1973-74), joining Olajuwon (five times) and Derrick Coleman (once). •Recorded his second-straight triple-double (third of the season) with a 13-point, 12-assist, 11-rebound effort on 11/28 vs. Sacramento, becoming the first Warrior since Wilt Chamberlain in 1964 to post a triple-double in back-to-back games. •Notched his second triple-double of the season with 14 points, 10 rebounds and 10 assists on 11/27 at Phoenix. •Recorded his first triple-double of the season (second career regular-season triple-double) with 16 points, 12 assists and 10 rebounds on 11/14 vs. Brooklyn. •Became the first Warriors starting forward to dish out 12 assists in consecutive games (11/12 at Minnesota; 11/14 vs. Brooklyn) since Rick Barry did so in 1976. •Missed one game due to rest. •Appeared in 23 postseason games (all starts), averaging playoff career-highs of 15.4 points, 6.0 assists, 1.78 blocks and 38.2 minutes to go with 9.9 rebounds and 1.61 steals, shooting 43.1 percent from the field. •Scored 20-plus points six times and 30-plus twice. •Tallied nine postseason double-doubles, one triple-double and one 30/10 game. •Per NBA.com’s Hustle Stats, contested 15.6 shots per game, third-most in the postseason. •Tallied 32 points and a 2016 postseason-high 15 rebounds, his first career 30/10 game (regular-season or playoffs), to go with nine assists in a postseason career-high 47 minutes in Game 7 of the NBA Finals on 6/19 vs. Cleveland... Scored 22 points in the first half, the most scored in a first half of an NBA Finals Game 7 since Walt Frazier scored 23 points in the first half on 5/8/70... Connected on six three-pointers (6-of-8 3FG), tying the record for most threes made in Game 7 of the NBA Finals set by Shane Battier in 2013... Joined James Worthy (36 points and 16 rebounds for the Lakers in 1988) as the only players to produce at least 30 points and 15 rebounds in a regulation (non-overtime) Game 7 of the NBA Finals. •Missed his first career playoff game in Game 5 of the NBA Finals on 6/13 vs. Cleveland due to an NBA suspension. •Recorded at least one steal in 20-straight playoff games (dating back to the 2015 NBA Playoffs, 6/16/15-6/5/16), a career-best streak of playoff games with at least one steal. •Blocked a career-high seven shots (regular-season or playoffs) in Game 4 of the Western Conference Semifinals on 5/9 at Portland, adding four steals to become the first player since Ben Wallace on 4/23/05 to block at least seven shots and swipe at least four steals in a playoff game... Tied a playoff career-high with nine free throws. •Scored a career-high 37 points (regular-season or playoffs) on career highs of 13 field goals and eight three-pointers in Game 3 of the Western Conference Semifinals on 5/7 at Portland. •Joined Tom Gola as the only players in franchise history to post multiple playoff triple-doubles, tallying 23 points, 13 rebounds and a playoff career-high 11 assists in Game 1 of the Western Conference Semifinals on 5/1 vs. Portland... Hit a perfect 9-of-9 from the free throw line, a playoff career-high. •Recorded his 18th career postseason double-double with 12 points and 14 rebounds in Game 2 of the First Round on 4/18 vs. Houston to pass Paul Arizin for third-most playoff double-doubles in franchise history. •Appeared in 79 games (all starts), averaging 11.7 points, 8.2 rebounds, 3.7 assists, 1.56 steals and 1.25 blocks in 31.5 minutes. •Earned First Team All-Defensive honors, becoming the third player in Warriors history to be named to the First Team (Nate Thurmond, Andre Iguodala). •Finished second in Defensive Player of the Year voting (the highest finish ever by a Warrior), receiving the most first-place votes (45) but narrowly edged out by San Antonio’s Kawhi Leonard by 16 points... It was the first time the leader in first place votes did not win the award (since 2002-03 when voters were asked to rank top three). •Placed second in Most Improved Player voting behind Chicago’s Jimmy Butler, receiving 11 first-place votes. 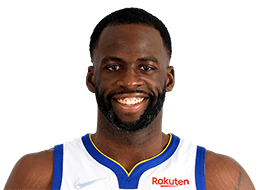 •Became the first player in Warriors history to average a block, steal and three-pointer per game and was one of just two players (Danny Green) to do so in 2014-15. •Hit a single-season career-high 111 three-point field goals. •Among NBA leaders, ranked second in plus/minus (+10.6), third in Net Rating (16.5) and tied for fourth in Defensive Rating (96.0). •Posted 18 double-doubles, including three 20/10 games... Recorded one triple-double. •Scored 11 of his 15 points from the free throw line on 3/21 vs. Utah, setting career highs in free throws made (11) and attempted (13), both Warriors season-highs. •Recorded five steals in back-to-back games on 3/14 vs. New York and 3/16 vs. the L.A. Lakers, becoming the first Warrior to do so since Baron Davis in 2008. •On his 25th birthday, tallied his third career 20/10 game with 23 points and 12 rebounds on 3/4 vs. Milwaukee. •Recorded his second career 20/10 game with 20 points and 13 rebounds on 2/7 at New York. •Grabbed a career-high 20 rebounds on 2/6 at Atlanta, the first 20-rebound game by a Warrior since Andrew Bogut grabbed 20 boards on 12/21/13. •Recorded his first career triple-double on 1/2 vs. Toronto with 16 points, a season-high 13 assists and 11 rebounds... Became the 27th player in franchise history to join the triple-double club. •Became the first Warrior since Chris Mullin in 1990 to record at least three steals and three blocks in consecutive games, swiping four steals with three rejections to go with a double-double (10 points, 10 rebounds) on 12/30 vs. Philadelphia. •Set a career-high with six steals on 12/27 vs. Minnesota to go with eight rebounds and six assists, becoming the first Warriors forward since Chris Mullin in 1997 to record at least six steals, six rebounds and six assists in a game. •Blocked a career-high five shots on 12/16 at Memphis. •Connected on a career-high seven three-pointers (7-of-13 3FG) on 12/6 at Chicago, tallying a season-high 31 points to go with seven rebounds, four steals, three assists and three blocks in 41 minutes. •Missed two games due to shin inflammation and one game due to rest after appearing in all 82 games in 2013-14. •Appeared in 21 postseason games (all starts), averaging 13.7 points, a playoff career-high 10.1 rebounds, 5.2 assists, a playoff career-high 1.81 steals and 1.19 blocks in 37.3 minutes. •Recorded 12 double-doubles, joining Nate Thurmond and Wilt Chamberlain as the only players in franchise history to record at least 10 double-doubles in a single postseason. •Finished the 2015 Playoffs with 212 rebounds, joining Wilt Chamberlain and Nate Thurmond as the only players in franchise history to grab at least 200 boards in a single postseason. •Tallied 16 points, 11 rebounds and 10 assists in Game 6 of the NBA Finals on 6/16 at Cleveland, the first triple-double by a Warrior in the postseason since Guy Rodgers in 1962 (first in franchise history in The Finals). •Tied a playoff career-high with five steals in Game 2 of the NBA Finals on 6/7 vs. Cleveland, scoring 10 points and grabbing 10 rebounds. •Recorded a steal in 15-straight playoff contests (5/1/14-5/23/15). •Posted four-straight double-doubles (every game of the First Round against New Orleans, 4/18-4/25), a career-long playoff streak, becoming the first Warrior to post four-straight point/rebound double-doubles in the postseason since Sleepy Floyd in 1987. •Scored a 2015 playoff-high 22 points in Game 4 of the First Round on 4/25 at New Orleans, grabbing 10 rebounds and dishing out eight assists. •Collected a postseason career-high 17 rebounds in Game 3 of the First Round on 4/23 at New Orleans. •Appeared in 82 games (12 starts), averaging 6.2 points, 5.0 rebounds, 1.9 assists and 1.24 steals in 21.9 minutes... Was the only Warrior to appear in all 82 of the team’s games. •In 12 starts, averaged 9.0 points, 7.4 rebounds, 2.7 assists, 1.41 steals and 1.41 blocks in 31.3 minutes. •Posted four double-doubles, including one 20/10 game. •Recorded the first 20/10 game of his career and the only 20/10 game by a Warriors reserve in 2013-14 on 4/14 vs. Minnesota, tallying season-highs of 20 points, 12 rebounds and four three-pointers (4-of-5 3FG) to go with five assists in 38 minutes... Became the first Warriors reserve to post a 20/10/5 game since Anthony Randolph in 12/5/09. •Hit the game-tying three-pointer with 3.9 seconds remaining on 4/13 at Portland to send the game to overtime. •Registered his third career double-double on 4/4 vs. Sacramento with 10 points and 10 rebounds. •Tallied 18 points, 10 rebounds and three steals in 38 minutes for his second career double-double in a start on 2/22 vs. Brooklyn. •Recorded his first career regular-season double-double with 11 points and 11 rebounds on 2/10 vs. Philadelphia. •Earned his first start of the season on 2/6 vs. Chicago, tallying nine points and seven rebounds. •Blocked four shots in consecutive games (12/29 at Cleveland; 12/31 at Orlando) to become the first Warriors reserve to block four shots in back-to-back games since Ronny Turiaf in 2009. •Appeared in seven postseason games (four starts), averaging 11.9 points, 8.3 rebounds, 2.9 assists, 1.71 steals and 1.71 blocks in 32.6 minutes, shooting a playoff career-high 46.7 percent from the field. •In four starts, averaged 13.0 points, 9.3 rebounds, 3.3 assists, 2.25 steals and 1.25 blocks in 37.1 minutes. •Finished the postseason by scoring in double figures in three-straight games for the first time in his career (regular-season or postseason). •Tallied 2014 postseason-highs of 24 points and five three-pointers (5-of-8 3FG) in Game 7 of the First Round on 5/3 at the L.A. Clippers. •Swiped a playoff career-high five steals to go with 14 points and 14 rebounds in Game 6 of the First Round on 5/1 vs. the L.A. Clippers, becoming the first Warrior to post a point/rebound double-double while swiping five steals in the playoffs since Clifford Ray did so on 5/12/76. •Appeared in 79 games (one start), averaging 2.9 points and 3.3 rebounds in 13.4 minutes. •Played in the first 79 games of the season before sitting out the final three, the fourth-most games played by any rookie in 2012-13 behind only Damian Lillard, Kyle Singler and Harrison Barnes..
•Made his first career start on 2/27 at New York, totaling four points and five rebounds in 27 minutes. •Scored a season-high 11 points on 12/21 vs. Charlotte. •Hit the game-winning lay-up on a backdoor cut with 0.9 seconds left on 12/12 at Miami. •Grabbed a season-high 10 rebounds on 12/7 at Brooklyn. •Scored his first career point on a free throw on 11/9 at the Lakers. •Made his NBA debut on 10/31 at Phoenix, playing one minute and grabbing one rebound. •DNP-CD twice... Missed one game due to right knee tendinitis. •Appeared in 12 playoff games (one start), averaging 5.8 points, 4.3 rebounds and 1.6 assists in 18.6 minutes, shooting 42.9 percent from the field and 39.1 percent from three-point range. •Recorded one double-double... Scored in double figures three times. •Hit multiple three-pointers in three postseason games, something he hadn’t done once in the regular season. •Made his first career playoff start in Game 2 of the Western Conference Semifinals on 5/8 at San Antonio, tallying five points, seven rebounds and five assists in 33 minutes. •Tallied 2013 postseason-highs of 16 points and 10 rebounds off the bench in Game 6 of the First Round on 5/2 vs. Denver, his first career double-double, becoming the first Warriors rookie to post a double-double in the playoffs since Chris Webber on 5/4/94 vs. Phoenix (16 points and 13 assists) and the first to do so off the bench since Chris Gatling on 4/30/92 at Seattle (14 points and 12 rebounds). •Made his postseason debut in Game 1 of the First Round on 4/20 at Denver, scoring two points and grabbing three rebounds in four minutes. •Participated in USA Basketball Men’s National Team Minicamp in Las Vegas in the summer of 2015. •One of 13 players named to the U.S. Men’s Select Team in 2014, which practiced with the USA Men’s Basketball National Team during its training camp in Las Vegas prior to the 2014 FIBA Basketball World Cup. •Appeared in 145 games (67 starts) over four seasons at Michigan State, averaging 10.5 points, 7.6 rebounds, 2.9 assists and 1.24 steals in 25.0 minutes while shooting 46.7 percent from the field and 36.1 percent from three-point range. •Finished his career as the school’s all-time leading rebounder (1,096) while ranking second in blocks (117) and steals (180) and 17th in scoring (1,517 points). •Became one of three players in MSU history to tally 1,000 career points and 1,000 career rebounds (Greg Kelser, Johnny Green). •Tallied three career triple-doubles, ranking second in Spartan history only to Earvin “Magic” Johnson (8). •Named the 2012 Big Ten Jesse Owens Male Athlete of the Year Award winner following his senior season, in which he earned Big Ten & NABC National Player of the Year honors and was a consensus First Team All-American. PERSONAL: Parents are Mary Babers, Raymond Green and Wallace Davis... Nickname is “Day-Day”... Has two brothers, Torrian Harris and Braylon Green, and three sisters, LaToya Babers, Jordan Davis and Gabby Davis... Brother Torrian played basketball for Nebraska-Omaha from 2009-11... In the summer of 2015, pledged to donate $3.1 million to his alma mater, the largest student-athlete donation in Michigan State Athletics history, to support two of the top priorities (facilities and endowments) for MSU Athletics in Empower Extraordinary, the campaign for Michigan State, and will help build a new strength and conditioning room in the Jack Breslin Student Events Center as part of an overall facility renovation... Celebrated the 2015 NBA Championship with a homecoming parade in Saginaw, MI, in late June, where it was revealed that his No. 32 jersey had been officially retired at Saginaw High School... Has hosted several basketball camps for youth in Michigan, including the Draymond Green Basketball Camp and All-Star Game in Grand Rapids, MI... Received the Key to the City of Emeryville, CA, in 2015 in a presentation by the Mayor and City Council... Was a finalist for the 2015-16 Seasonlong NBA Cares Community Assist Award... Throughout the 2015-16 season, took an active role in a variety of campaigns including #LeanInTogether, joining the NBA, LeanIn.org, the NBPA and the WNBA to launch the second year of #LeanInTogether, an ongoing public awareness campaign focused on the important role men play in reaching equality; joined the advisory board of RISE to help advance race relations; participated in the Warriors and Adobe’s anti-bullying campaign Not On Our Ground; launched a new partnership with The First Tee of the East Bay to help further its impact with at-risk and underserved youth in the Oakland/Hayward communities; and became the spokesperson for the Warriors and Bay Area BMW’s Go Green platform informing fans on how to be “green” at home... First job was a janitor at Ruben Daniels Middle School in Saginaw, MI... Majored in communications... Wears No. 23 in honor of fellow Saginaw native and former Warrior Jason Richardson... Is a fan of the Steelers, Yankees and Red Wings... Threw out ceremonial first pitch at a Detroit Tigers game on September 14, 2017 and before Game 4 of the NLDS between the San Francisco Giants and Chicago Cubs in San Francisco on October 11, 2016.